I purchase a lot of books - first editions, limited editions club, Franklin, reading copies - from eBay and document each experience to distinguish the good sellers from the ones to avoid. Here, I will highlight those sellers that one must be careful having dealings with. 1. rwsellers: this is an eBay seller who has a lot of signed first editions, but many of them are very dubious. Here's a great example: I was tracking the auction of an un-remaindered "Blood Meridian" without dust jacket from another seller, and it turned out that the book was purchased by rwsellers, who immediately relisted it, using the same picture from the original seller, at a 200% mark up. Fair game, and I have no problem with that, except that the copy is now signed! I thought I missed something from the original auction, but I didn't: the original copy was unsigned (Cormac McCarthy's signed copies fetch a premium). It is possible that rwsellers got the book signed by McCarthy subsequently, but that's not the case: rwsellers' copy is not flat signed. Rather, the signature is on a separate piece of paper that is then pasted onto the unsigned copy. I made an enquiry on the provenance of the signature and rwsellers claims that the signature is genuine and was cut out from another of McCarthy's signed book. I asked to see the book from which the signature was cut, and was treated with radio silence. This is all too dubious, and they have a lot of "signed" first editions of similar fashion on sale. I'll avoid then because they violate the rule to never pay a premium for a book plate or inserted signature because the likelihood of forgery is very high. 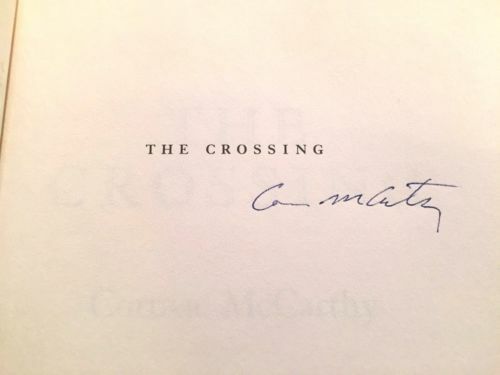 On 25 January 2016, rwsellers put up a "signed" first edition of McCarthy's "The Crossing" for sale. There is only one official signed first edition, but that is not what rwsellers offer. Instead, their copy is one that is flat "signed" by McCarthy on the half title page, which is extremely rare. Rwsellers ask 295 USD for this copy when an unsigned one goes for as low as 20 USD. I append rwsellers' signature with an authentic one from the official signed first edition of "No Country for Old Men". You be the judge. An authentic signature for an official signed first edition of "No Country for Old Men"
2. burnsiderarebooks: a good eBay seller who packs the books very well and has an interesting range of first editions in stock, but suffers from two issues. One, the book condition of its offerings tend to be concentrated between Good to Very Good, meaning either the dust jacket is worn/faded or the book has bumps/remainder, which the seller specify quite clearly, and that's good. Two, the price tend to be on the very high side for the book condition they offer. I think the mark up is generally 100% of what a book is really worth. This is a seller who you can visit and buy books from, but only if the "Best Offer" option is available, in which case a first offer should be 50%-65% of the listed price. You'll be surprised how readily they accept such offers. Have a look at their sales history on eBay and you will notice a lot of "Best Offer Accepted" sales. 3. vagbk: another eBay seller I avoid. He tends to over-grade book conditions by at least two notches (e.g., a G+ book will be graded as VG+ by this seller). Also, this seller has tendency to not mention major flaws in the description unless you ask. Be very wary of his offerings with dark, unclear pictures that capture only a portion of the book, which is his tactics to hide major flaws like chipping, clipped, or torn dust jackets. I bought a book from him before, and he thought it was fine to not mention a 3cm by 8cm triangular tear (material loss) at the top of the dust jacket. If you really must buy from him, demand more pictures. 4. rare-book-cellar: avoid buying any Franklin Press books from this eBay seller because the prices are ridiculously inflated. This seller lists $30 Franklin press books in the $200 range and has the habit of listing signed limited edition of Franklin Press as first edition first printing when it is not (e.g., John Updike's Rabbit Redux).